Green Crack is a potent and powerful blend of 75% Sativa dominant genetics which produce an energizing and focused cerebral high and invigorating 'body-buzz' from it's 22% THC levels. Highly prized and sought after for it's heavy yields and forgiving nature. You can buy Green Crack feminized seeds in complete packs of 5, 10 and 20 seeds. Each guaranteed to germinate, creating one of the most potent Marijuana strains available. Find out more about Green Crack Seeds. Green Crack Cannabis contains very high levels of THC combined with low CBD levels. This produces a powerful, intense high that can be energising and relaxing leaving you feeling happy, creative and euphoric without that lazy feeling. Green Crack seeds produce tall plants, easy to grow and forgiving of many mistakes. 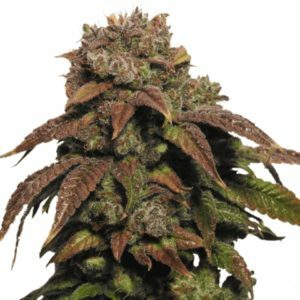 A perfect strain for both novice and experienced growers alike with heavy yields of large, dense buds. Grows well both indoors and outside during the Summer months. A strong, powerful form of Cannabis that provides an uplifting, relaxed, euphoric feeling. Perfect for daily use, can help to reduce stress, tension and anxiety, lifting depression, leaving you relaxed, energetic and happy. Read the complete Green Crack Medical Marijuana Seeds Review. Buy Green Crack Seeds today and receive free worldwide shipping guaranteed.